While ignorance of the law may be no excuse for breaking it, for most people, the law seems inaccessible and often incomprehensible. 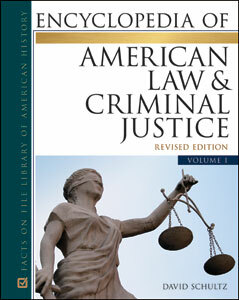 In more than 700 entries, Encyclopedia of American Law and Criminal Justice, Revised Edition breaks down the complex workings of America's criminal justice system in a way that readers can understand. Now in two volumes, this A-to-Z encyclopedia covers a wide range of relevant topics, including police, courts, corrections, laws, and famous criminals, as well as such timely and controversial subjects as bullying, cameras in public places, cyber crime, juvenile death penalty, and much more. A primary resources section contains documents that are vital to understanding this important subject.